It’s time to decorate for fall! October is pumpkin time, and there are so many great ideas out there for personalizing your pumpkins. Each weekend in October, I’ll be sharing some new pumpkin projects for you to try out. If you have great ideas for decorating pumpkins, drop me a message in the comments so I can share your ideas with everyone! Last week was all about simple embellished pumpkins. This week, we’ll be making a bit more of a mess (still no “pumpkin guts”, though!) as we delve into painted and decoupaged pumpkins. I’ll begin by saying that if you’re a natural artist, these projects probably aren’t for you. If you can just pick up a brush and create beautiful designs and artwork simply from the inspiration in your head, you don’t need any help! But if you’re like me, and you need your projects to be a little more “crafty” than “artsy”, you’ll love these ideas. For my own house, I decided to paint a trio of small pumpkins using paint left over from my recent living room redecoration. The pumpkins will match my decor while still adding a fall touch to the room. 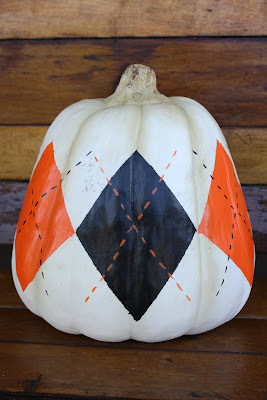 Do you paint, decoupage, or stencil your pumpkins? What do you use for inspirations? Drop your ideas into the comments below! I like to paint them but matural paints because then I leave them out for food for the wildlife. oops all natural I meant! !